The efficacy of RARC in oncologic outcomes compared ORC is controversial. We assess potential differences in oncologic outcomes between robot-assisted radical cystectomy (RARC) and open radical cystectomy (ORC). We performed the literature search systematically according to the Preferred Reporting Items for Systematic Review and Meta-analysis statement. 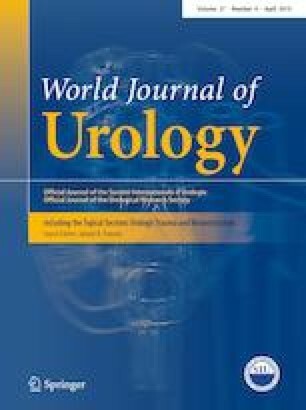 A pooled meta-analysis was performed to assess the difference in oncologic outcomes between RARC and ORC, separately in randomized controlled trials (RCTs) and non-randomized studies (NRCTs). Five RCTs and 28 NRCTs were included in this systematic review and meta-analysis. There was no difference in the rate of overall positive surgical margin (PSM) in RCTs, while NRCTs showed a lower rate for RARC. There was no difference in the soft tissue PSM rate between RARC and ORC in both RCTs and NRCTs. There was no difference in the lymph node yield by standard and extended lymph node dissection between RARC and ORC in both RCTs and NRCTs. There was no significant difference in survival outcomes between RARC and ORC in both RCTs and NRCTs. Based on the current evidence, there is no difference in the rate of PSMs, lymph node yield, recurrence rate and location as well as short-term survival outcomes between RARC and ORC in RCTs. In NRCTs, only PSM rates were better for RARC compared to ORC, but this was likely due to selection and reporting bias which are inherent to retrospective study designs. Takehiro Iwata and Shoji Kimura contributed equally to this project. The online version of this article ( https://doi.org/10.1007/s00345-019-02708-8) contains supplementary material, which is available to authorized users. The authors gratefully acknowledge the contributions of all study participants and staff. TI: Project development, Data collection, Data analysis, Manuscript writing. SK: Project development, Data collection, Data analysis, Manuscript writing. BF: Project development, Data collection, Data analysis. NF: Manuscript writing (Performed writing discussion section). AB: Manuscript writing (Performed editing introduction and discussion section). PIK: Manuscript writing (Performed critical editing result section). KMG: Manuscript writing (Performed writing result section and editing discussion section). SE: Manuscript writing (Performed writing discussion section). YN: Manuscript writing (Performed critical editing discussion section). MA: Project development, Data collection, Data analysis, Manuscript writing. SFS: Project development, Manuscript writing. All authors read and approved the final manuscript. The ethical approval was unnecessary because this study based on summary and analysis of the results of previous studies.